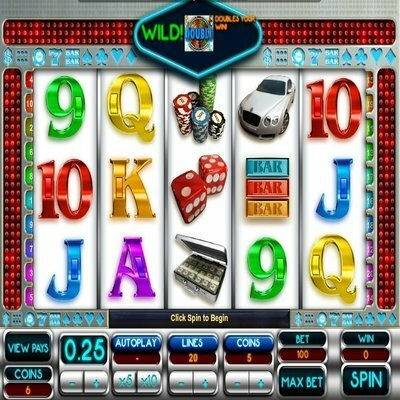 [miau] It can sometimes be easy for slot machine designers to create a game that looks like it has plenty of Las Vegas style to it, but it takes a little extra to get a game to offer a real Las Vegas experience. The Vegas Dreams Slot machine goes that extra step and delivers a genuine Las Vegas feel. There is no plot to this slot machine, but the obvious theme is winning and having fun in Las Vegas. There must have been a lot of research that went into creating this game because there are images and sound effects in this game that date back to the 1970’s or earlier. But it all comes together nicely into a game that any Vegas enthusiast can enjoy. As we mentioned, the highlights of this game are the music and sound effects. From the hustle and bustle of the Strip to the sound of an old fashioned slot machine pouring out someone’s winnings, all of the sounds you could ever need to remind you of old Vegas are here. There are a few quick sound effects that sound like people just having a good time playing slots, which has a strange way of making you want to keep spinning the reels on this game. The icons and graphics in this game have an old style look as well, but they also take you back to a day when Vegas was king. From stretch limos to piles of cash, the icons on this game do a lot to remind you of just why the game is called Vegas Dreams. Vegas Dreams is a five-reel slot machine that has a couple of different scatter symbols that trigger a whole lot of free spins. There are a few classic Vegas bonus games that pop up from time to time such as an old spinning wheel and a three-reel slot machine, which all add to the retro nature of this online slot machine. There are 20 pay lines on Vegas Dreams and you never know when a scatter or bonus symbol is going to pop up on any of the reels. Playing the max bet is always recommended for every slot machine, but there is something to be said for the benefits of playing the max bet whenever you spin the reels on Vegas Dreams. Every online slot machine is created to be fun, but the Vegas Dreams online slot machine really nails it and has a lot to offer. There are plenty of ways to win in Vegas Dreams and there are also some fun graphics and sound effects to enjoy as well.